This morning as I was pumping my tires up before meeting the group for our morning ride, I basically pulled the valve out of the inner tube, and obviously all the air streamed out and I was left with a flat. 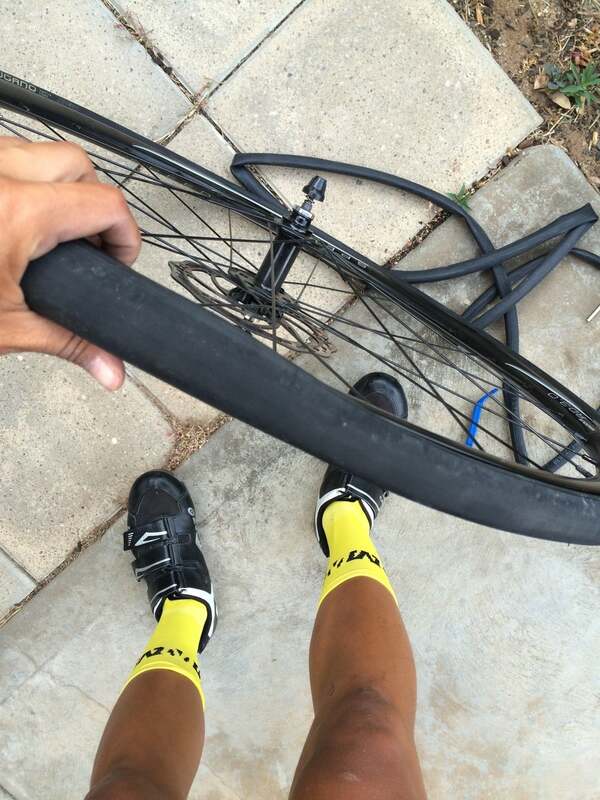 Now I've seen people change flats a few times but I've never actually done it myself. So I ran through the steps and just did it methodically and slowly. It was a dirty sweaty ordeal, and putting the tire back on after changing the tube was the hardest thing ever for my thumbs, but eventually I succeeded! It was honestly such an awesome feeling to have accomplished and fixed it all on my own, and I was mighty proud of myself, heeh. Then after getting to the meeting spot, we waited about ten minutes for the rest of the sunday crew to roll in, and MAN there was so many people I couldn't believe it. There must have been about ten people that I'd never even met, and it was such a high vibeing buzzing atmosphere. So this morning Griff, Biggi, Anton and I went up to Lofty at just a cruisy, easy pace. We were all feeling it after our hard efforts yesterday so we didn't want to push too hard. Then we came back down and saw the group coming up Nortons again, so we turned around and went up Nortons with them. Then we sat down and just chatted for ages. Mostly about food since we were all getting a little hungry. We discussed the beauty of bubble tea, asian noodles, smoked tofu, and red bean delicacies. Then when we decided to finally go back down, Abdullah decided to do one last rep of Nortons, so a few of us decided to join him. The guys all went up at a fast pace, but I just stayed back and cruised up once again. It was at that point, that we finally decided to call it quits and head back home, but like I do every time, I missed the turn off for my street, so I circled back around the opposite way to ride back the way I came. And because of that, I was once again headed towards the hills, and some crazy part inside of me was egging me on saying: cmon just go up Nortons one more time, CHALLENGE YOURSELF! ahah so I listened to that crazy voice, and went up Nortons real slow, and it was tough as nails. I felt pretty queasy and really weak, but I thought, man I'm at Nortons now I might as well go up to Lofty, so off I went and continued on to Lofty. By the time I got to Lofty I was pretty pooped. No, REALLY pooped. So I just sat at the top, skulling water, and eating packs and packs of raisins. After that I realized that I had just been dehydrated and hungry, and besides that I felt fine since I was taking it so slow. So since I saw that I was at like 79kms, I thought I'd try to make it to 100. So I went down Greenhill road, then back to my place. By that time I had like 95 km's and like 1840m of elevation. I was so close to both 100kms and 2000m of elevation, so I decided I'd try to get those numbers by just going a km or two back up Nortons then down to home. And it worked out flawlessly. I went up 2 more kms which gave me just the amount of elevation I needed for 2000m, then by the time I got to right outside my house, I was at 100.3 kms. I couldn't have planned it more perfectly. haha, but needless to say, I was hungry and drained. So after a few bowls of cereal with coco pops, peanut butter, and jam, I showered and took a beautiful nap. Then I woke up just in the knick of time for me to bike to Govindas on time to meet the crew at 5:30. Govindas is an all you can eat, Hari krishna restaurant that's all vegetarian and basically 99% vegan. It's $10 and for that you get unlimited rice, dahl, chickpea potato curry, this "chicken" dish, and dessert. AND MAN I FEASTED! I had 4 heaping plates full, and by the end of it I felt pregnant. Once again, there was a huge group of us vegans there, and we just all ate our hearts out and had a merry time. On the ride over, Callum got a flat from a huge nail that went into his tire, and the guys tried fixing it twice, but each time his tire popped the tube, so he had to get an uber back, and the guys were late to dinner. Anyways, after we all ate our fill, the notion of getting gelato came up, so we all rode into the city to Gelatissimo to get dessert. I got a waffle cone with passionfruit and green apple ice cream, and the moment I finished it, I regretted not getting a triple scoop. Then after I got home around 10, I had 3 bowls of cereal because wierdly enough I was STILL hungry. I seriously don't know what's going on with my appetite, like am I pregnant or something and eating for two? I eat until I'm stuffed, but I guess because I bike from place to place, I always manage to work up an appetite by the time I get to the new location. But now I'm truly stuffed and ready for bed.